them to their original habitat. at a special meeting in Djerba, Tunisia. 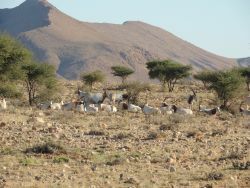 the region, including a remnant population of Saharan Cheetah. a tradition of capturing baby gazelles for trade. networks that gathered information on the elephant killings. of what could have been a massive slaughter. and discussion groups covering a range of topical issues. The photograph was kindly provied by A.